Goodluck Jonathan is currently the president of the Nigeria - one of Africa's most powerful and influential countries in the region. What do you want to ask Goodluck Jonathan? Jonathan has been president of the country with nearly 160 million since 2010 - before that, Jonathan was vice-president of Nigeria. Earlier in the month, Jonathan officially declared that he will run in the 2011 elections, lauding his achievements in reforming the oil, banking and electricity sectors. "I have decided to humbly offer myself as a candidate in the presidential primaries of our party the great PDP (People's Democratic Party)," he said. Jonathan's official declaration comes three days after he informally announced on Facebook that he intended to run in the primaries, which will be held between October 18 and 20, according PDP spokesman Rufai Alkali. "In presenting myself for service, I make no pretense that I have a magic wand that will solve all of Nigeria's problems or that I am the most intelligent Nigerian," Jonathan wrote on his Facebook page Wednesday. Jonathan - who is from the Niger Delta, in the south - was part of the joint ticket of the late President Umaru Yar'Adua, who was from the north. Yar'Adua's death in May, after a long illness, upset the order of the zoning. Yar'Adua was elected in 2007 and his southern replacement threatened to halt the north's turn at holding power. 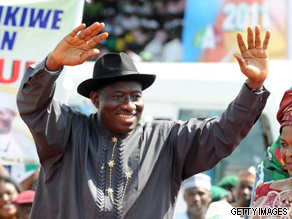 Here is your chance to quiz Nigerian president Goodluck Jonathan. Dr Goodkuck Jonathan, God Almighty has ordained you President of the Federal Republic of Nigeria come 2011, Amen. The CBN Governor is forcing Banks to close down branches Nationwide and worsen the security position in the country by throwing out thousands to swell the unemployment market. Please Mr President stop the excesses of the CBN Governor. Sanusi is at the point of selling the so called Rescued Banks to his cronies/sponsors. CBN by law is a Regulator of banks and not in the business of selling banks. By law the CBN Governor can not appoint the Chief Executive/Executive Directors of banks because as an independent regulator can not be seen to be partisan/player in an event/industriy in which he is the regulator/refereee. CBN should handover the Rescued Banks to the shareholders to recapitalise within specific time frame as was done to UNITY BANK. CBN Governor has raised Risk Management in in Banks to a level that Criminalise Lending and hence Banks in Nigeria are not lending. The basic function of banks is to intermediate between the surplus(savings) and the deficit(investment) ends of the economy by promoting saving culture through openning more branches and investments by giving loans to promote wealth and employment creations. Mallam Sanusi is doing the reverse thus fueling insecurity in the country. Mallam Sanusi is not loyal to the President and to the Federal Republic but to a CABAL bent on undermining the good job of the President, Dr GoodluckJonathan. I am afraid the economy would remain comatose until Sanusi and Farida Waziri of EFCC are sacked. Please how do u plan to tackle kidnapping and the issue of epileptic electricity supply in Nigeria. I am Oke, writing from Port-Harcourt.I want to know how "One Man, One Vote" can be achieved when the biometric machines to be used for voting are powered by electricity and we all know that the electricity/power situation in the country is below average. what are ur aims for presenting urself to the nation? could make a promise for the nation? Here's my question - how would he go about addressing (and solving) the massive religious divisiveness in Nigeria? How would he go about implementing these solutions? As an aspiring candidate, what have you done so far that will make us vote for you??? Small issues to let the people know you care, u made Obama like speeches in ur campaigns but I know Obama could have told America that morning on tv why nepa is going on strike and how the issue would be resolved soon. Am from Niger Delta and I will not vote on sentiments, becos I am firstly a Nigerian. You do not potray the character of a president I want to have. good day. we saw the confusion in you . nonetheless, if you are truthful enough to know where Jonathan started from, you will know where we are and where he is taking us to. the truth is that Nigerian is developing. if you think Jonathan is not working,my question is their any work that was done that he spoil? think, ................what u say affect those around you.""""""""""""""""" It has been said that you will seek only a single term of 4 years. How on earth will you be able to implement your programmes of change, given the weak nature of the Nigerian economy. Your Party has been in Power for 12 years, what will you be able to achieve in 4 yrs what your Party has not been able to do in 12yrs? Mr President what are your major achievements since you took over the mantle of leadership. We all know that our country's biggest challenge is corruption what are your achievements in that regards. When will our leaders stop doing this to us? In politic and power, there is different from were you were and were you are. The case of Yar’Adua and Jonathan as lectural and as president does not stop AUSS from embarking on strike. During the election and campaigning period many of us were blindfolded with sympathy of different though and we are ready to change the political system of Nigeria. “Those who want change easily forget that the price for change is more expensive than doing things the old way” we voted Jonathan and change the political system of Nigeria. Jonathan promise fresh air with dynamic change while the Northerner contestant and leaders promise to make the country ungovernable if we don’t vote them. At when those threats where made, many of us think they were unserious while Mr. President was very busy begging for votes. Now, their threats are becoming reality and none of us is thinking and holding those who made those threats responsible for fulfilling there promise. Why must we criticize every thing done by Mr. President? Being the commander in Chief, does that make him an arm carrier to confront terrorism; is the president not given the arm forces the right orders? Are the security agencies not getting their full resources to combat terrorism? Should the President declare state of emergency now that it is comparable like the days of Tafawa Balewa who in a seminar situations, declare state of emergency in South-West which led to so many compacted problems. Where has it been said in the world that government dialogue with terrorist, Should the President who is refer by those who know litter or nothing about government or governance refer him as a “weak President” Bomb blast those trouble Northern areas like the days of Obasanjo to the Udi Community which was condemned by concern citizens of the world as inhuman, so he can be call a strong President. (Due to the long stay of Military rule in Nigeria, Nigerians are familiar with Military rule. For this reason, many cant different between Military rule where orders are follower and democracy where rule of law is follower). Moreover, when a woman is pregnant, she goes throw a lot of pains before labor to deliver. Nigeria is pregnant to give birth of the new constitution. Things are unfolding for the birth of a new constitution. There is no law on terrorism in our constitution but law of necessity. Another question is those dying for this new course, are there our national heroes or are there dying for some politician selfish reasons. The North has not experience real crises because when a child fight and he’s been separated, he wants to fight more. If the North had know how Warri is regretting the Ijaw – Itsekiri – Urhobo Crises that made Warri lost the headquarters of many oil company to Port-Harcourt, there will stop killing the zones economy. You have been president since February. In that time, what is the greatest thing your administration has achieved that would compel Nigerians to vote that you continue to be president? While declaring that you will run for office, you promised to do several things if elected and to solve several of the problems that Nigeria faces (amongst them lack of electricity, corruption and insecurity). Why couldn't you do those things in the last 8 months and why should anyone believe you can achieve these things if elected again? What are your plans for education and job creation. As a former lecturer and now a politician, how has your view on University Autonomy ASUU is demanding changed? What is your present position and do you think Government can continue funding of education under the present system. If no, what system of University administration would you recommend ? I do understand that we all need to join our hands together to build a new Nigeria. I am also sure that you are that if anything goes right or wrong in the country...you are responsible. I will appreciate it if you can itemized the major problems in Nigeria and tackle them with the power of the presidency of Nigeria. I was part of the pressmen who interviewed you in South Africa in 2008, I hope you will be the goodluck Nigeria is actually waiting for. Mr. President, how do you hope to reverse hold oil companies accountable for their environmental degradation in the Niger-Delta? How do you plan to solve the problem in the power sector.and i believe if that works their will be job creation for the unemployed youth, the other sector will definitely pick up. Can we point to anything that you have done in the last 4 months to justify Nigerians keeping you at the helm for another 4 years? This is Ifeoluwa from, Epe, Lagos State. What is your track record sir? You were a deputy governor, governor, vice president, and now president... I can not see anything tangible to hold on to that you have done to deserve us giving you our votes, infact, I see your campaign, and the campaign of a host of others as a direct slap on the face of Nigerians and a clear show of the mediocre nature of followership which we still practice in Nigeria. We need leaders with a proven track record, what achievements have you had in your many years in public office? And just by the way sir, your wife has still not cleared herself of corruption charges against her, or am I missing something here??? Mr. President, Based on what Political and Economic Ideology are you going to Lead Nigeria into the prosperous future we all want ? His Excllency. Congrats! For your second term bid because when a righteous takes the lead, the masses rejoice. But, sir, it is obvious that all the PDP governors may return with you as many of them are already warming up: but there are many of them in the south East who are so wicked to the poor masses. I am not trying to criticise anybody but, do you know sir, that for over 4 months now ASUU @ south East have been on industrial actiön? Students roaming all the whole place causing social vices? The level of poverty in one of the states there grows higher, even one of the state governor is so autocratic that he sworn not to implement the new minimium wage to the workers when approved by you sir. Infact, we cant enjoy your govt.because of that old governor sir. My question now sir, what measure will you take to check the excessiveness of all these governors? Congrats in advance once again my amiable president. Joel in Ebonyi state. Goodluck Jonathan should as a matter of priority, follow through on his proposed liberalization of the power sector, with the appropriate legal framework to encourage FDI. this will solve a lot problem facing the country e.g Power shortage, infrastructure, manufacturing, education and unemployment. viable power sector will lead to a tremendous growth in manufacturing and foreign investment, therefore creating jobs. Mass transportation including viable rail system across the entire nation will create at least 1million direct and indirect jobs which is going to be a massive boost for the economy. cap on government officials wages, limit on foreign travels for Govt. official unless necessary, and a workable healthcare system will solve Nigeria most pressing issue within 4 years. The people clamouring for power ration are just the corrupt ones, they're looking for an avenue to steal and loot the treasury and make their co-looters richer. those people don't want Nigeria and Nigerians to move forward. Enough of distractions, No power rotation in the constitution, End of Story. the northerners have ruled Nigeria for 32 years out of 50! Time for them to take the passanger seat unless Nigerians decides to vote for someone who can do the Job regardless of his / her tribe. Dear mr president I kn you are a good man, would you choose good men and women to help you change the cause of Nigeria!!!! We are sick and tired of the same old faces over and over, how do u intend to deal with or fight corruption in Nigeria!!! The state governors in Nigeria are like gods, especially in the Eastern part of Nigeria where some governors does not follow the rule of law but enjoys the court verdict ( Ikedi Ohakim ) that kept them in office................ Victory for you mr president, I hope I become ur campaign manager in my local council. How do you plan to fix the decaying infrastructures in the country. thousands of Kilometer of bad roads, decaying airports, congested sea ports, electricity. secondly, why is your administration since 2007 decided to continue with the short sightedness of obansanjo administration by allowing the rail sector modernization to be carried out without upgrading to the standard gauge system, why are we relying on china to build us a rail system when China and Japan depends on France and Germany to do theirs? As for me, Jonathan should be given the green light with all support needed to impact a lasting change. Mr President, I have a double barrel question for you. Do you think it is proper for candidates to seek elective position using a political party only to dump that party when they win the election and join another political party while retaining their elected position. Also, assuming you fail to win your party (PDP) presidential primary ticket, will you decamp from PDP and contest the Presidential election as a candidate of another political party? (it's an assumption please, so don't tell me you will win the ticket). My major concerns are 3. 1: Looking at the Nigerian economy and current CBN fire-brigade reform, Nigeria's economy is nose diving into bankruptcy. My observation is this, taking over banks by CBN, sacking their directors and appointing cronies by the current CBN governor is a big shame. My question is, if those banks were owned by foreigners, would CBN do what it did? 2: My second question is on what the president has done since he was elevated, to fight the endemic corruption and scams in Nigeria. We read and heard in the western media how Nigerian former presidents were bribed by western multinationals to get government juicy contracts. Those expatriates concerned have been sanctioned by their respective countries but seems Nigeria is shielding those Nigerians indicted in these bribery cases. Up until now, no one has been charged to court or prosecuted. 3: What will your government do to create jobs and revamp the dilapidated infrastructures, and all sectors in the country? i am christopher mwambingu,a human rights and social justice worker from kenya.dr goodluck,i wish you good luck in your endervours.truly speaking,your short term as a president of nigeria has been a success in terms of promoting human rights, democracy and good governance.i would like to see your presidency,play active role in the African Union interms of fighting poverty,promotion of human rights,democracy,good governance,peace and security.you should also engage in promoting fare,but not free trade, and democracy in global lnstitutions,like the UN and the IFIs.God bless you. 1. Why does the official website of the Nigerian government have a link (via 'Blog') that takes one to a GoodluckSambo 2011 campaign page? Does this not contravene INEC laws? Please refer to Section 100 "Campaign for election" which states "State apparatus including the media shall not be employed to the advantage or disadvantage of any political party or candidate at any election." 2. Considering the fact that the nation has a long way to go in the area of development, would you not consider N17b a waste on Nigeria @ 50 celebrations? In the same vein, can the nation justify buying three new presidential jets and importing 60,000 plastic dustbins from the UK to be used in Abuja? 3. On corruption, why does there seem to be no headway in bringing high profile corrupt officials to justice? The general belief is that this is because you have been part and parcel of the government all along and you are no different from leaders before you. What are your comments on this? How will you as the president of the Nigeria Improve the lives of young people who are living under poverty line? goodluck jonathan has got nothing to offer to nigeria all his has got is gridlock corruption .the frudulent election is bound to repeat it self which brougth him to power however he will like to pretent he will dilivered on his promise to give free and fere election to all nigeria,let me remind you mr president promise are meant to be kept or is as whorteless as a tissue paper garbage, you promise nigeria free and fere election the issue of massive coruption that have left your poeple were you came from to become backward in every field you can immagine and most importantly energy supply that has cripple the country economy for many dacade tell all nigeria why you chose to waste all nigerian time by just sitting on an office thats is not meant for you pls bow out with your hart in shame. Mr President, when you took over this office, you promised to resolve the epileptic electrical power supply, a plague that has infected us since 1960 to date. What have you achieved in this area? Also, what would you say is your biggest achievement since coming to power? What have you put in place to ensure a free and fair election? What also makes you think it will be fair? Finally, what makes you qualified to contest for the job of president? What credentials are you bringing to the table? Mr. President, pls my own view is this. what will be your extrem action against the isue of trival differences/religeous crisis particularly in jos? Becouse something must be done to tackle this criminal acts made by some bad and irrespective individual in our country. Pls All we need is Active president who jodge things accordingly. He is painssg authority to the Vice-president? Like Putin painssg authority to Medvedev in Russia. Are both the Egyptian vice president and Medvedev both puppets on a string?? I say Mubarak will be gone alot sooner then that now that he's announced his intentions.RainbowRay???? ?